Hon’ble Mr. Justice Vijender Jain, Chief Justice, Punjab and Haryana High Court visited Central Jail Amritsar on January 2, 2006. The chief Justice launched the website of Amritsar Jail in the gracious presence of Justice K. S. Garewal, Administrative Judge of Amritsar Sessions Division. Later on, The Chief Justice inaugurated the renovated Kaveri Block of this jail and also laid the foundation stone of a model hostel building to be constructed on the model provided by BPRD(Bureau of Police Research and development). The hostel will accommodate 100 inmates with modern lavatory, kitchen and dining facility including special section for sports facilities. 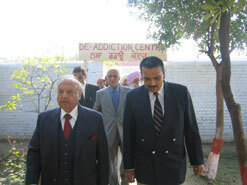 The Chief justice also visited Women’s Vocational Centre, De-addiction centre and Education block. He interacted with the prisoners and gave a compassionate hearing to their grievances. He assured to expedite the cases of the undertrials especially those related with old age women. He appreciated the ongoing reform process in Amritsar Jail and suggested that the other jails should follow the reforms initiated by Amritsar Jail. At this occasion, a cultural and religious programme was presented by the prisoners. Kunwar Vijay Pratap Singh, DIG, Central Jail presented the vote of thanks and assured to implement further reforms to improve the quality of life of the prisoners. Sh. Gurdev Singh, District and Sessions Judge, Sh. Kirandeep Singh Bhullar, Deputy Commissioner, Sh. Nawab Singh Registrar General of High court, Mr Varinder Aggarwal CJM, Sh. Roop Kumar Superintendent of Jail, Swami Satyannadji of Chaturvidh Yog Ashram, Rtn. Randeep Singh Arora, Rtn. Upkar Singh Sethi, Rtn. Surjit Sharma and Awan Parashar are the prominent dignitaries who were present at this occasion.